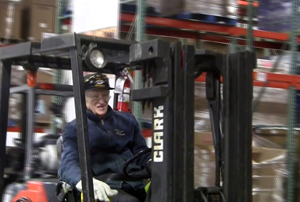 The Akron/Canton Regional Foodbank (ACRF) is the source of food for over 450 soup kitchens, homeless shelters and food pantries across 8 counties in Northeast, Ohio. "Our partners are charities that serve about 180,000 different individuals every year across the region. It's an agency with tremendous scope," Dan Flowers, President and CEO of the ACRF, said. Nearly all of the charities that are members of the food bank have been operated exclusively by volunteers, since their start in 1982. Most of them are faith-based as well. "They represent all types of faiths and denominations that are united in the mission to help feed people in need," Flowers said. The New Year has brought a brand new vision for the ACRF. 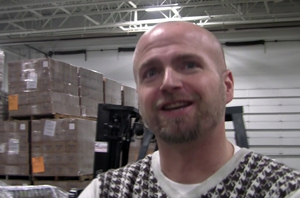 "This year we're on pace to distribute about 19.5 million pounds of food. We have big plans for 2012. There are so many people that are coming and asking for food for the first time. People talk about the current recession in past tense, but we don't. In 2008 the number of people seeking emergency food from the food bank really skyrocketed," Flowers said. Over the last 4 years the ACRF has had a 50% increase in the amount of food that they've distributed. Flowers has been with the ACRF for 15 years now. His love for helping others and interest in grant writing led him to where he is today. "I traveled around remote areas of rural Michigan helping set up food pantries and dealing with beautiful, sweet volunteers at community agencies," Flowers shared of his early experience. "I think that experience somehow transformed my perspective and made me fall in love with food-banking. This is something I truly love and care about," he continued. 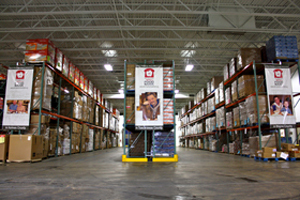 The food bank had an increase in the number of people seeking emergency food each quarter in 2011. Their numbers have not gone down since 2008. Though Flowers says there are some indications that the recession is beginning to yield, they have not seen any evidence of it. 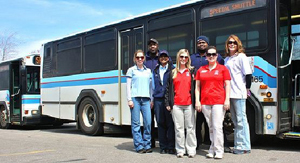 "There are so many extensive needs in this community. There are so many people that are in crisis. We can distribute 100 million pounds of food and still not get everybody's needs met," Flowers said. "The crisis in people's lives in this community continues to be ongoing. At the food bank we're continuing to be committed to feeding people and fighting hunger, which is our mission," he continued. "Our model is to take surplus food and give it a home on the plates of people in need, keeping good food out of the landfill. That's about as good as it gets. It's a beautiful, pure mission," Flowers said. The truth is that a lot of food is going to waste in America. "But we can bring it back into the community and put it on the plates of people in need at a very, very low cost," Flowers said. The ACRF warehouse is filled with fresh produce, much of which is surplus food that is donated from manufacturers in the grocery industry. The ACRF receives surplus food from the grocery industry which includes 150 local manufacturers, wholesalers and distributors, bringing back food from local grocery stores and produce from local farms. They also have 7 semi's running across 5 states bringing back food. "Over the last few years these donations have been harder to come by, but at the same time, the community's come forward," Flowers said. "Our clients come in typically two profiles," Flowers said, "Chronic poverty and situational poverty." "Chronic poverty looks like the working poor people, but it also looks like disabled people and senior citizens on fixed incomes that can't work," he explained. Over half of their clients are over 65 or under 18 years old. "They are very vulnerable members of our population," Flowers explained. The ACRF is seeing more and more people who are working and can't make ends meet. "They don't have health insurance; they live on subsidence wages…" Flowers said. "Every time you give someone a bag of groceries it not only feeds them but gives them an opportunity to pay their heating bill or buy their kids shoes," Flowers said, putting it in perspective. Among all the food bank does, food safety is their number one priority. "We take great care to use the highest standards of food safety," Flowers said. With all of the recent recalls on food, this is a major plus. Along with that is making sure children are getting the nutrition they need. 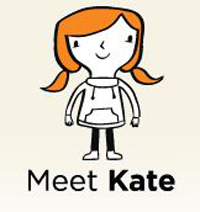 Their new campaign "Meet Kate" introduces "Kate" – a young girl who represents all 95,000 children who struggle with hunger in our area. You may never guess "Kate" is hungry by the way she looks. They've also started "Kid's Power Packs" where volunteers come in and make different breakfast and lunch boxes for kids. They worked with various charities to distribute over 100,000 of these power packs last year and continue on in this endeavor.